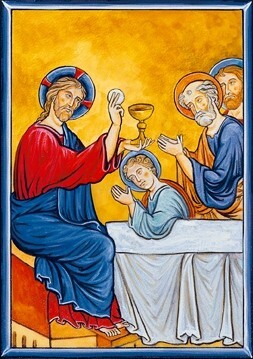 In today’s First Reading the author of the Letter to the Hebrews reminds the Christians who formerly participated in Jewish worship at the Temple, before embracing Christianity, that the old sacrifices of animals offered by those priests did not have the power to take away sins, and now Our Lord, the High Priest of a new covenant, offers the perfect sacrifice, once and for all, of himself. His sacrifice takes away the sins of the whole world. Our Lord sacrificed himself on the Cross and, upon ascending into Heaven after the Resurrection, took this sacrifice, himself, to the Father and now at the Father’s right hand continues to intercede for us before the Father as priest and sacrifice. Whenever we celebrate the Eucharist we offer the same sacrifice, the perfect sacrifice, but in an unbloody manner. Our Lord was crucified on Calvary, and now, sacramentally, we offer his Body and Blood to the Father for our sins and for the sins of the whole world. However, we do not just offer it for sins; we offer it in thanksgiving, we offer it for our needs, we offer it for the needs of the whole world as a priestly people. Like our High Priest, Jesus, we too can offer our day-to-day sacrifices, united with his perfect sacrifice, for the good of the whole world. Sacrifice for sacrifice’s sake does not appeal to anyone. Our Lord teaches us that our sacrifices can benefit not only ourselves, but those we love. Let’s not shy away from sacrifice for the sake of others. Readings: Hebrews 10:11–18; Psalm 110:1–4; Mark 4:1–20. See also 16th Week in Ordinary Time, Wednesday, Year II and 24th Week in Ordinary Time, Saturday.